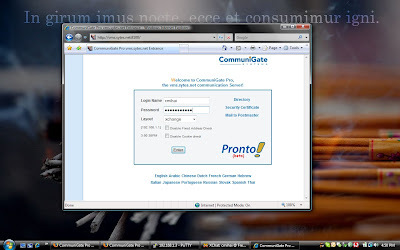 Communigate Pro is by far one of the best communications suite, and can easily replace even an Exchange / LCS / OCS suite (Unified Communications and all that). 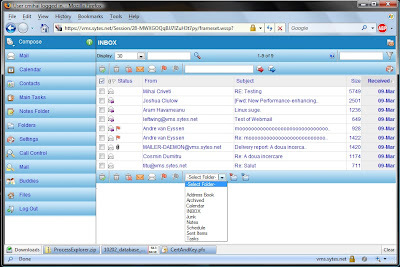 It can do clustering, VoIP, interface with Windows phones and has integrated WebMail, mailing lists, and so on. The installation is pretty straight forward too. First, disable OpenVMS POP3 and IMAP services, and make sure nothing is running on port 8010 and 8100. Then unzip and proceed to install the POLYCENTER package. Once the installation is over, start CommuniGate Pro services and login to the administrative interface withing 15 minutes. Enjoy. It also has Calendar function and a few themes (the XCHANGE one looks like OWA from Exchange). 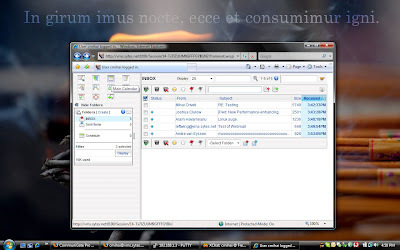 So now you can have a fully encrypted, secure, highly available enterprise communications suite with E-Mail and VoIP features on your OpenVMS cluster :-). another fine web email product is Quintera from Brilliant Systems. 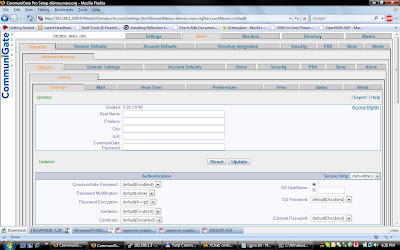 Do you know whether it correctly removes sendmail under OpenSolaris? I think just stopping the service from listening on port 25 on the interface is enough. svcadm disable sendmail or see svccfg to disable listening on various interfaces.